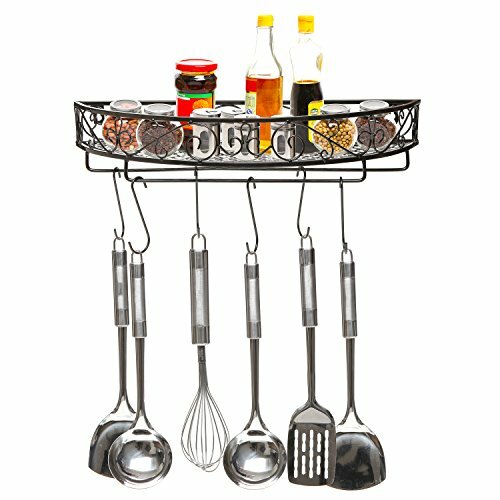 Keep pots and pans stylishly displayed and within easy reach with this wall-mounted pot rack. 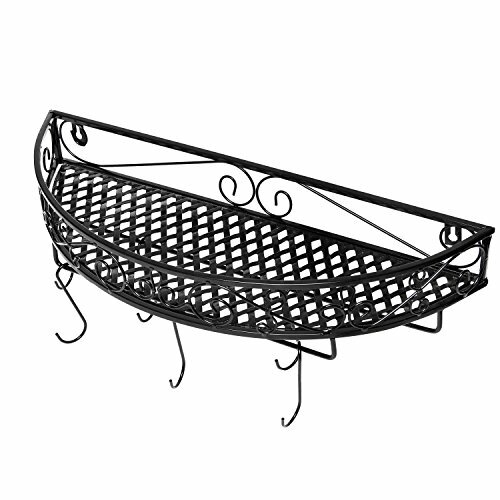 The sturdy metal that makes up this pot hanger features a decorative scrollwork design and a classic black finish that fit in beautifully with any décor, and you can easily install this kitchen storage rack on any wall using appropriate mounting hardware (not included). 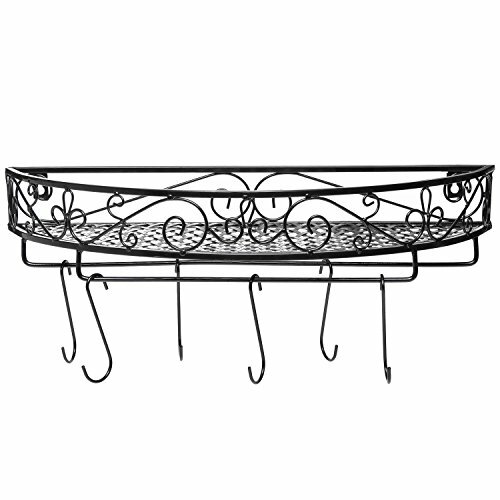 Use the 6 removable metal hooks that can be hung from the 2 sturdy metal bars on the bottom of this pot holder to hang up your pots, pans, and utensils with ease, and take advantage of the metal shelf at the top (which comes complete with a scrollwork railing) to keep store and display dishes, utensils, and knickknacks. Ready to bring both style and organization to your kitchen? Make this wall mounted storage rack yours today! **Official MyGift® product, includes multipurpose cleaning towel. 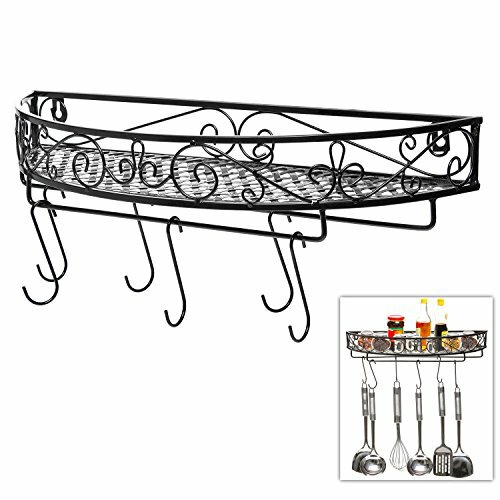 Approximate Dimensions: 19.5" W X 7.25" D X 3.5" H.
Wall-mounted pots / pans hanger with a decorative scrollwork design. 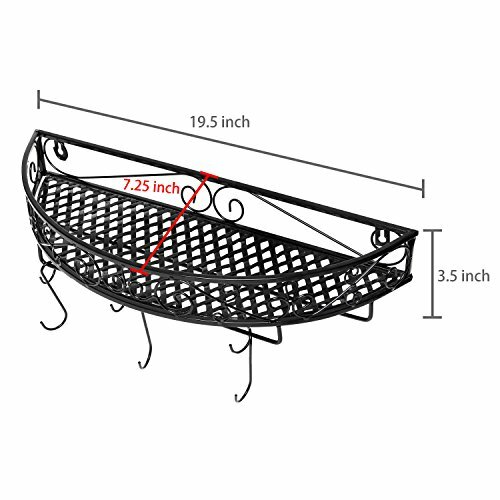 The 6 removable metal hooks can be hung from the 2 metal bars at the bottom of this pot holder and used to hang pots, skillets, saucepans, and cooking utensils, while the metal shelf on the top is perfect for kitchen storage and features a scrollwork railing to prevent falls. Easy to attach to any wall using the appropriate installation hardware (not included). Made of metal. Approximate Dimensions:19.5" W X 7.25" D X 3.5" H.